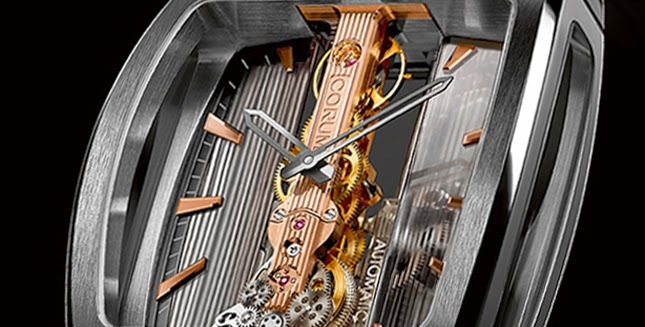 The latest interpretation of the Corum Golden Bridge is the Golden Bridge Automatic Titanium which combines the iconic baguette movement - here in a spectacular automatic version with a linear oscillating weight - to a titanium case with black DLC (Diamond-Like Carbon) treatment. The tonneau-shaped case (37.20 mm x 51.80 mm) well highlights, with its dark colour, the red gold movement while the metalized sapphire dial plays with transparency. In fact, the dial is transparent when the watch is not worn but it turns opaque on the wrist thanks a particular striated metalized decoration on the sapphire crystal case back. The gold hour-markers applied on the sapphire dial accentuate the depth effect. The hands are open worked in order not to obstruct the view of the beautiful movement. Equipped with a platinum linear oscillating weight along with a slipping spring mechanism, the CO313 calibre beats at a frequency of 4 Hz (28,800 vibrations per hour) and features a variable-inertia balance to guarantee long-term high precision. A miniaturized barrel, offering 40 hours of power reserve, was designed to harmonise with the vertical architecture of the 194-part movement, whose red gold mainplate and bridges are adorned with a finely hand-crafted vertical guilloché. 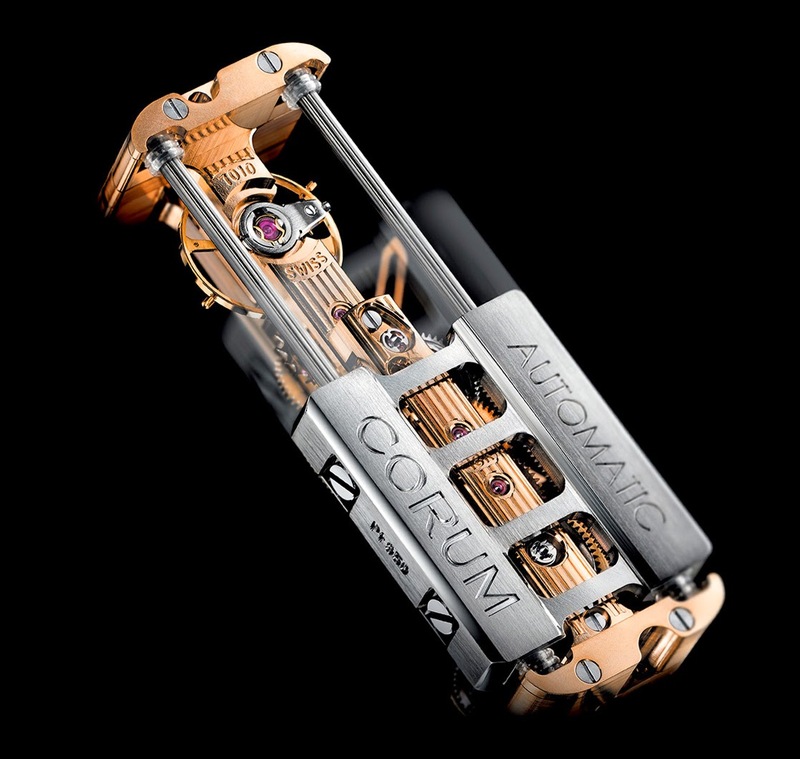 Introduced at BaselWorld 2014, the new Corum Golden Bridge Automatic Titanium comes on a black crocodile strap fitted with a titanium pin buckle bearing the Corum key, and is water-resistant to 30 metres. 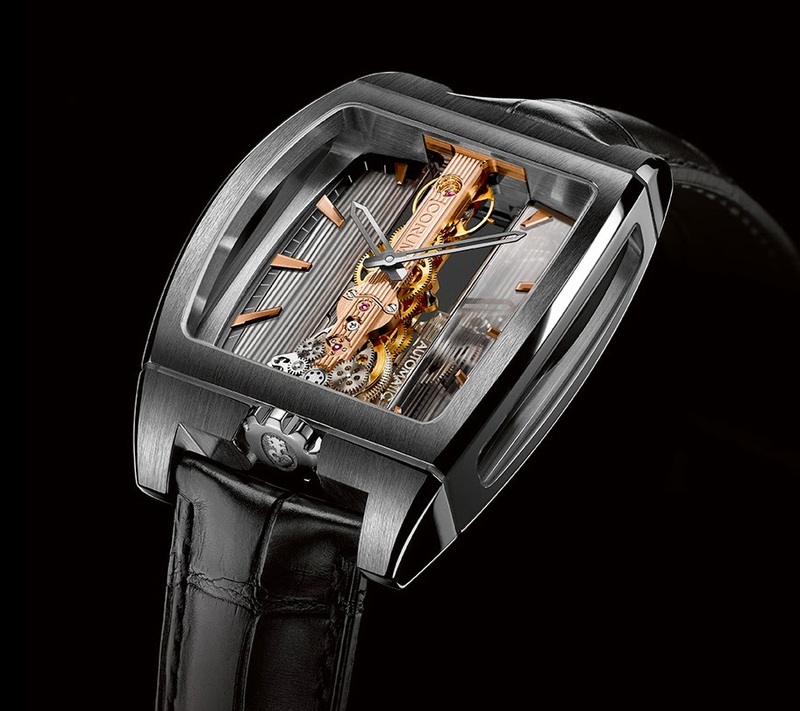 The latest interpretation of the Corum Golden Bridge is the Golden Bridge Automatic Titanium which combines the iconic baguette movement - here in a spectacular automatic version with linear oscillating weight - to a titanium case with black DLC treatment. 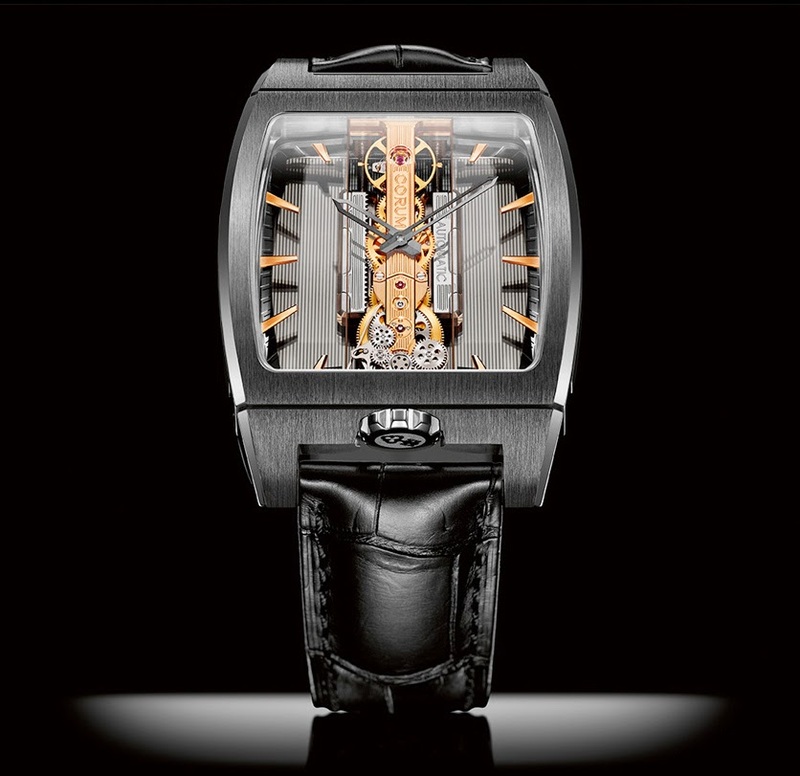 Introduced at BaselWorld 2014, the new Corum Golden Bridge Automatic Titanium comes on a black crocodile strap and is water-resistant to 30 metres.